This salad is a delicious way to use your leftover chicken or turkey. It can also be enjoyed without the meat for a yummy vegetarian/vegan dish. Pomegranate is a powerful anti-oxidant rich fruit that also contains important fatty acids for brain health. Studies indicate that it inhibits both the proliferation (rapid growth) of breast cancer cells and inflammation. One 2011 study found that an active phytochemical within pomegranate fruit called ellagitannin inhibited an enzyme known as aromatase, which is required for the production of estrogen in the body. Since the bulk of breast cancer cases are reliant upon estrogen to fuel their growth, this is promising research. Pomegranates are also considered one of the best foods for helping to prevent prostate cancer (along with green tea, broccoli, and turmeric – which is also part of this tasty salad). Spinach is a leafy green vegetable rich in iron, vitamin A, carotenoids, anti-oxidants and anti-inflammatory compounds which all help to reduce your risk of cancer. Using pastured poultry along with organic produce and spices will give you the greatest cancer-fighting benefits. Feel free too to add any additional veggies you enjoy to the salad such as red cabbage, mushrooms, red onions, etc. Wash the spinach and tear into pieces placing them in a large bowl (baby spinach can be left whole). Prepare the herbs and spices and add to the bowl. 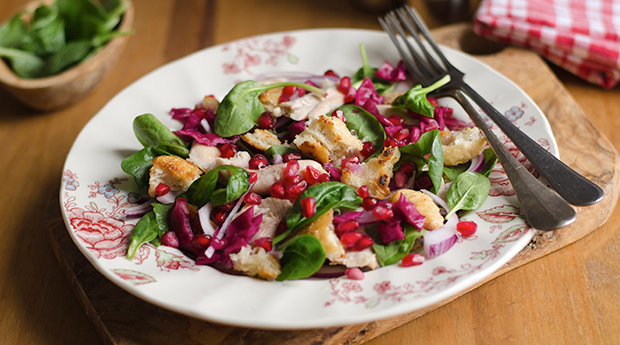 Top with the chicken and pomegranate seeds. Add the olive oil and vinegar. Toss thoroughly. Add salt and pepper to taste. Put in serving bowls and enjoy! Want to be notified once a week when other awesome articles, videos, or recipes are added? Then click here for our free weekly digest. You’ll also receive a FREE eBook & Special Video: Revealed: Sugar A Deadly Hidden Cause of Cancer. Go here to get your free copy. Pomegranate extracts potently suppress proliferation, xenograft growth, and invasion of human prostate cancer cells. How incredibly irresponsible promoting chicken as a cancer fighting food! At least you state that the chicken is optional. The only real cancer fighting foods are fruits and vegetables. Or more accurately, consuming a diet with a high intake of fruits and vegetables while limiting all animal foods reduces the risk of most cancers. 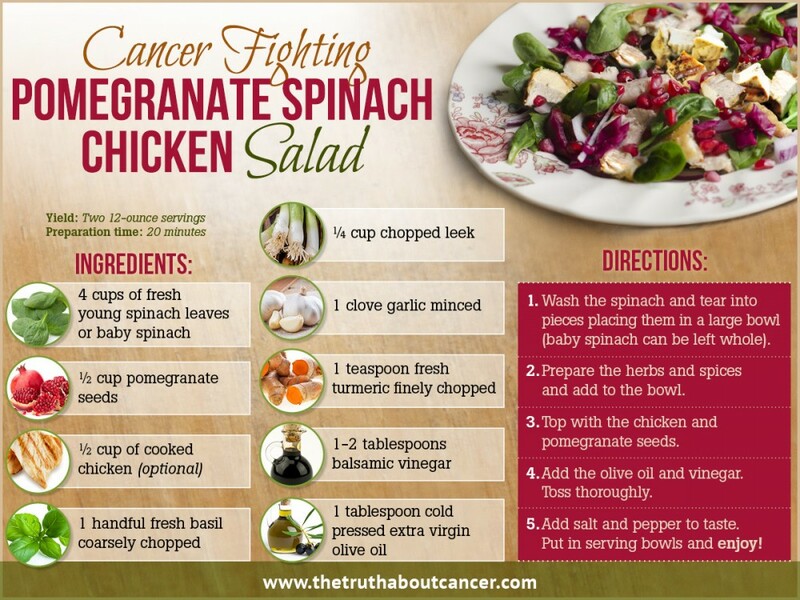 Foods don’t really have the potency to fight cancer. Elimination of all animal products and adopting a low-fat plant based diet has been shown to improve outcome in cancer treatment and to help prevent recurrence. Chicken is very high in methionine which stimulates anabolic cellular processes or in other words, stimulates tumor growth. It does not matter if the chicken is conventionally raised or pasture raised. The amino acid makeup of the muscle tissue is the same. I do not like to inject negativity into these articles but both you and Ty have to start listening to the experts in this field. 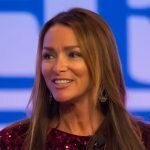 The work you are doing is remarkably helpful in exposing the truth about conventional cancer therapy but the messages regarding natural and nontoxic cancer treatment are blurred with inconsistencies and unsupported claims. My recommendation is to consult the excellent work of Dr. Michael Greger, Dr. John McDougall, Dr. Neil Barnard, Dr. Dean Ornish, Dr. Thomas Lodi and T. Colin Campbell, PhD. If you are interested, I will be happy to share my research in the area of nutritional oncology, plant-based nutrition, cancer cell biology and the high effective cancer treatment protocol that I have developed. Good points, Mark. Consider speaking the truth with love and gentleness. I totally agree with Mark, lifestyle and mental outlook also play a part. This is a good recipe! I should try it out. This salad looks delicious. Mark, it seems diet is not simply ‘black or white’ so we mustn’t become dogmatic about our own stance in this area. For example, if you watch the short video above your comment – ‘Using Enzymes as a Cancer Treatment’ we hear that Dr Gonzales used different diets for individual patients. Some of his patients were prescribed meat 3 times daily and (along with his other protocols) this brought about complete remission in some cancers. What works well for one is not necessarily good for everyone. Totally agree that Chicken shouldn’t be on this when meat (including chicken) is a known carcinogen. Love everything that this website stand for though.